Android Users: I’ve included links to the Android apps where available. However, please be aware that my reviews are based on the iPhone and iPad versions as those are the devices which I own. Pricing is current as of this writing but is always subject to change. Read on for my latest favorites in cooking apps! Special Features: As you browse through the handful of articles (updated weekly), you’re “rewarded” with additional recipe content. For example, in this week’s edition I unlocked a collection of seven fruit-filled dessert recipes upon reading a piece by longtime Gourmet magazine writer Kemp Minifie about her late father and the strawberry shortcakes he made. The content is available for a limited time, but you can purchase back issue for 99 cents. 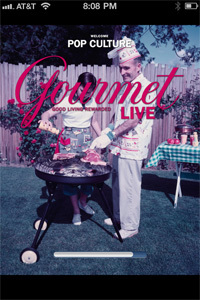 It’s Great Because: Gourmet Live is one of the cooking apps that I launch most often. It’s enjoyable to sit down for a few minutes to read through articles every week. The limited time nature of the content spurs me to check out the new issue every Wednesday. The articles are concise yet substantive, worthwhile but not too heavy – thoughtful food-related vignettes is how I’d describe them. A benefit of the weekly updates is that the topics are often timely, such as the recent piece about the extreme couponing craze. What Would Be Even Better: There are have been some technical glitches. Some people, including myself, have had difficulty opening the app at times. I’m sure they’re well aware of the issue (mentioned frequently in the iTunes feedback), so I imagine a fix is coming. I often wish I could comment on articles and share them via email or social media. Unlike with most apps, these features are not enabled with Gourmet Live, most likely because their revenue model relies on people purchasing past content. Special Features: No special bells or whistles here. 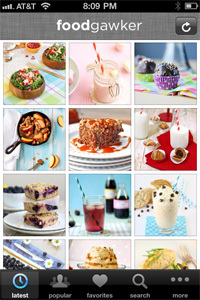 It’s a straightforward app that lets you browse the gorgeous food photography on Foodgawker in a mobile-friendly format. One extra benefit of the app vs. the website is the ability to easily share items you like on social media (e.g., Facebook, Twitter). It’s Great Because: Navigating a photo-heavy website like Foodgawker can be a challenge on an iPhone, with long load times, but the app makes it much faster. What Would Be Even Better: At the moment, there’s only an app for iPhone but an Android version is on the way. 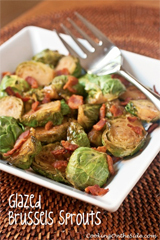 Special Features: This is a general, comprehensive recipe app. It has many of the now-standard cooking app features, such as an in-app cooking timer and a unit converter. 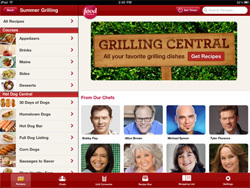 The most notable special feature that distinguishes it from other apps is the ability for those with a FoodNetwork.com account to access their saved recipes from within the app. It’s Great Because: It’s a robust collection of recipes from the hosts you know and love from the Food Network, Food Network Magazine and their test kitchens. 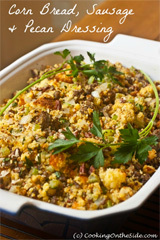 Generally, I’ve found Food Network recipes to be very good and this app makes it easier to access them on the go. What Would Be Even Better: If there’s an option to sort or filter the recipe searches I didn’t find it. For example, I easily pulled up a list of recipes from my favorite Food Network host, Ina Garten, but it wasn’t possible to sort according to her highest rated or most popular recipes. I appreciate they included a shopping list function, but it doesn’t aggregate the ingredients across multiple dishes (i.e., if you’ve got ingredients for three different recipes on your shopping list and each recipe calls for an onion, you’ll see onions listed in three places on the list rather than a single listing for 3 onions). You’d expect videos from an app that supports a television network, but oddly enough there are none. 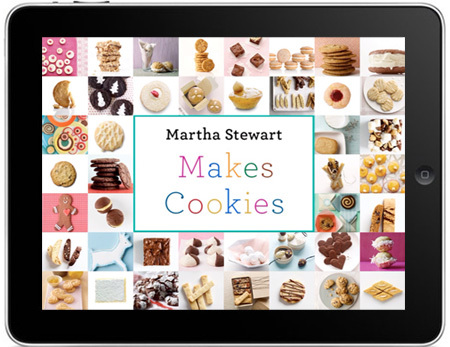 Special Features: A “cookie runway” format allows you to slide your finger across the screen to browse gorgeously shot photos of cookies, organized according to taste preference. I scrolled along until I reached “The Hedonist”, and sure enough the Lemon Bars and Salted Toffee-Chocolate Squares were right up my alley. How-to videos and in-app cooking timers help even novice bakers to execute the recipes. 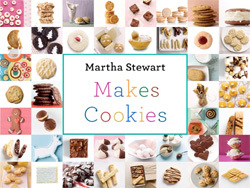 It’s Great Because: Martha is known for her cookies. Even though there’s a relatively small number of recipes within the app you can feel confident that they’ve been carefully chosen. Also, like the Martha Stewart magazine, the app is visually very attractive from the photography to the navigation to the recipe layouts themselves. What Would Be Even Better: You pay a little for brand here. I’m sure you could find equally wonderful recipes for free with other cooking apps. But you might have to weed through a bunch of lower-quality recipes to get to them, it might not be as pretty…and it won’t be Martha. Great For: Anyone who would like to have a better understanding of the food items they’re buying at the store. Better for those who buy brand-name products vs. store brand. Special Features: You can scan almost any product in your pantry or at the grocery store and the app will analyze the nutritional information and tell you the good and bad points about the product. If you’ve chosen, say, a pasta sauce that’s overly salty it will suggest other brands that may be healthier. 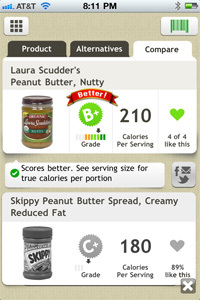 Better yet, if you’re trying to choose the healthier of two products, you can scan both and the app will tell you which is “better”. It’s Great Because: It can be a challenge to decipher the nutritional data on food labels – this apps does all the work and explains it simply. Once you start scanning the items you regularly buy, it’s rather eye-opening to see how well (or poorly) they rate in this system. What Would Be Even Better: The value of this app, of course, depends on it knowing the nutritional data of whatever you’re scanning. Even with 200,000 UPC codes in the system at present, there were still a number of items (particularly store brand products) that Fooducate couldn’t analyze from my pantry. 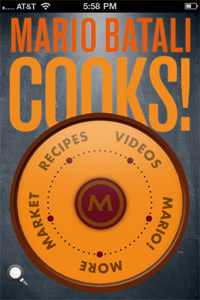 Special Features: This is as close as most of us will get to having Mario Batali right beside us in the kitchen. There is a treasure trove of recipe videos – one for each recipe – covering everything from Arancine (rice balls) to Zabaglione (egg yolk and marsala custard). There are also a slew of technique and kitchen basics videos to demonstrate the best way prepare garlic without the use of a “garlic torturer” and how Mario uses different kinds of salt. He even includes advice for purchasing fresh ingredients and wines. It’s Great Because: I could spend hours learning from this app (and plan to do so). It is an incredibly thorough cooking coach. Without question, Mario Batali went for quality over quantity with this app. At first glance, $9.99 seems like a steep price for an app containing just 63 recipes. 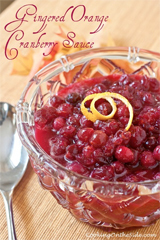 But when you consider that each of those recipes comes with a how-to video and images for each and every step, along with videos and other content to guide you on every technique and ingredient needed…it’s practically a bargain. What Would Be Even Better: Even though the app is available for the iPad, it’s not really optimized for it from a layout perspective. All of this rich content begs to be displayed in a large horizontal format, but for some reason it’s only presented in a portrait orientation on the iPad. There’s an odd sliding window format that you need to open and close in order to view all of the content. Hopefully in an update we’ll be able to use the full, horizontal screen. I have not been compensated to review any of these apps and I purchased all paid apps myself. Love this Kathy, thanks for putting such a great list together! Thanks, Tracey – I hope it’s helpful! Thanks for the great post! My kids and I have spent a lot of the morning punching in barcodes and have had quite an education! We have cleaned out our pantry for the summer and will cook more of your recipes from your great website! Sorry…on the Fooducate app…it’s AWESOME! Thanks for this! I’ve been wanting to download some cooking apps! I think Mario’s app is WAY overpriced…hasn’t he already made enough money? Yeesh! Hi there, great article. However, I’m a student at university, can you recommend me an app? I looked at the ‘top banana recipe cards’ app which is supposed to aimed at students, but it has a very limited selection. Any help would be greatly appreciated. I have been using http://pepperplate.com with free apps for iPad and iPhone. They seem to have the right feature for the right device and really easy to use. My iPad stays in the kitchen most of the time now. I have an Eee Pad with Andriod downloadables, not an Ipad.. How can I get come of these items of interest to download to my Eee Pad??? I’m afraid I’m not familiar with the Eee Pad but you might check the Android Market – I’m pretty sure that many of these apps are now available for Android.